On 5 September 1548, shortly before the death of the Dowager Queen Katherine, her will was written out and signed by the queen. The testament attests to the sanity of the dowager queen as she dictated her will. Other observations by the queen’s ladies differ from the statement in her will that “Lying on her deathbed, sick in body, but of good mind, perfect memory and discretion” as written in ‘The State of Mind of the Dowager Queen’. It wasn’t until December 6th, 1548 that the will and testament was proved by the Archbishop Thomas Cranmer of Canterbury. It was probated or officially verified and approved–referring not only to the will itself but also to the certification of its having been proved, which was delivered to its executors. The original will was in Latin; it was edited and transcribed into English in Janel Mueller’s Katherine Parr: Complete Works & Correspondence (2011). 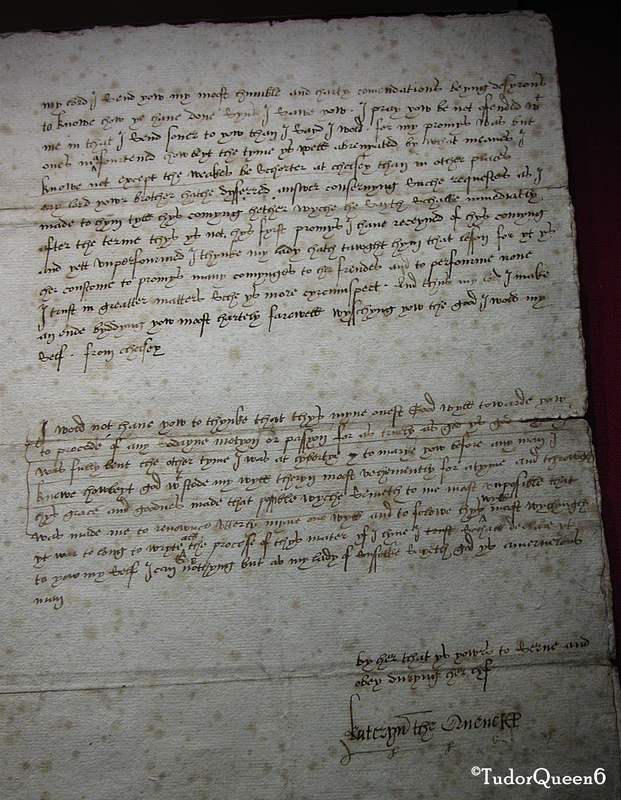 Not the last will and testament of the Dowager Queen, but an actual letter from Katherine to Lord Seymour as shown at Sudeley Castle, February 1547. The most noble and excellent princess, Dame Katherine, Queen of England, France, and Ireland; late the wife of the most excellent prince of famous memory, King Henry VIII, late King of England; and then wife to the right honorable Sir Thomas Seymour, knight of the noble Order of the Garter, Lord Seymour of Sudeley, and High Admiral of England. This is to say, the said most noble Queen, by permission, consent, and assent aforesaid, did not only, with all her heart and desire, frankly and freely give, will, and bequeath to the said Lord Seymour, Lord High Admiral of England, her married espouse and husband, all the goods, chattels, and debts that she then had, or in value than they were or been; but also most liberally gave him full power, authority, and order, to dispose and prosecute the same goods, chattels, and debts at his own free will and pleasure, to his most commodity. These were witness to the premises: Robert Huick, Doctor of Physic, and John Parkhurst. Given [at] the castle of Sudeley, the day and year aforesaid. The testament was probate in the presence of the lord Archbishop of Canterbury at London the sixth day of December, in the year of the Lord one thousand five hundred and forty-eight. He conjointly appointed Roger Lynute procurator and Thomas Seymour executor of this testament. And completion and approval were attended to with all due honors, so that we have faithfully attended to the same. • Janel Mueller. Katherine Parr: Complete Works & Correspondences, 2011. This entry was posted in Uncategorized and tagged will of catherine parr, will of katherine parr by tudorqueen6. Bookmark the permalink.